Hamlet (Ladi Emeruwa) and Horatio (Matthew Romain) in Globe to Globe Hamlet playing at Chicago Shakespeare Theater’s Courtyard Theater, July 28–30, 2014. Photo courtesy of Shakespeare’s Globe. 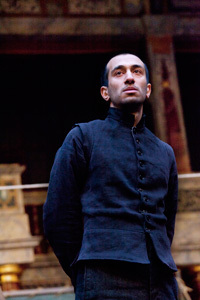 Hamlet (Naeem Hayat) in Globe to Globe Hamlet playing at Chicago Shakespeare Theater’s Courtyard Theater, July 28–30, 2014. 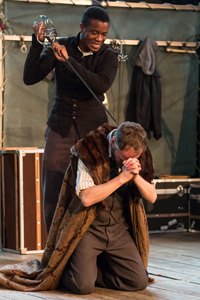 Ophelia (Amanda Wilkin) and Laertes (Tom Lawrence) in Globe to Globe Hamlet playing at Chicago Shakespeare Theater’s Courtyard Theater, July 28–30, 2014. 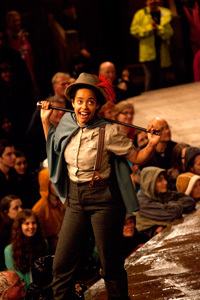 Ensemble member Amanda Wilkin in Globe to Globe Hamlet playing at Chicago Shakespeare Theater’s Courtyard Theater, July 28–30, 2014. Hamlet (Ladi Emeruwa) and Polonius (John Dougall) in Globe to Globe Hamlet playing at Chicago Shakespeare Theater’s Courtyard Theater, July 28–30, 2014. Hamlet (Ladi Emeruwa) and Horatio (Tom Lawrence) in Globe to Globe Hamlet playing at Chicago Shakespeare Theater’s Courtyard Theater, July 28–30, 2014. Gertrude (Miranda Foster) in the Shakespeare’s Globe world tour production of Hamlet, a World’s Stage presentation in Chicago Shakespeare’s Courtyard Theater, July 28–30, 2014.